Note from Rockhill Youth Pastor, Angela Moyer: For a week in July, 22 youth and adults from Rockhill Mennonite Church headed to Mexico City, Mexico to serve with four CIEAMM (Mexico Mennonite Conference) churches. 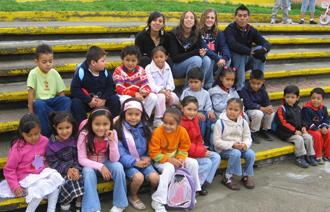 The group, split into four different teams, serving the following congregations: Seguidores de Cristo, Pueblo en Transformacion, El Buen Pastor, and Cuatro Vientos. After months of fundraising, prayer, and preparation, departure day had finally arrived. It was in the early hours of July 14 that our group of 22 packed into vans and left for the airport at Newark, NJ. For the next few hours, we remained in our comfort zones, only anticipating what we would see and do. As soon as we landed though, the entire group walked into a different place; a place that would teach us life lessons and stretch our horizons forever. We arrived in Mexico City and God already had a test in store for us. We had four groups, and a couple of the groups were informed that they would all be staying in separate host houses. This caught me off guard. All of my excitement from being in a new place turned into fear of leaving the rest of my group. However, as with most of the trials that we were faced with, this turned out to be an enjoyable and stretching challenge. Another obvious challenge was the language barrier. Once again, God provided for our group in this area. We were gifted with leaders and youth group members who could speak enough Spanish to make communication fairly easy. My smaller group was also blessed with a young US American woman named Hannah serving with MCC who was living at the church we were working at. She was fluent in both Spanish and English, making communication with the church members much easier than anticipated. Groups were assigned various tasks to accomplish during the week, ranging from painting to teaching Bible School. The kids were such a blessing to us; their smiling faces and constant laughs always brightened the day. The group that I was a part of also painted the stairway and the front of the church called Seguidores de Cristo. We were proud of the work that we accomplished during the week, but the most rewarding part of our week were the many friends we made. Upon returning home, the group shared one Sunday morning in church. As we shared one common theme appeared: the relationships we made with the Mexican people. Their hospitality, patience, and generosity will not be forgotten. They put their schedules aside for one week in order to accommodate us and all of our needs. They never once showed frustration with us as we stumbled through their language and declined to have the extra spices put on our food. One of the guys in our group, Evan, had his 16th birthday while we were there. His host family decided to wake him up by coming into his room with a birthday cake while singing “Happy Birthday.” This experience was special for him and left an impression on all of us. I know that as I grow older many of my experiences in Mexico will become distant memories. The sites, sounds, and tastes will slowly fade away as my busy life continues in Pennsylvania. The one thing that I will always remember though, is the people, their kind hearts, warm smiles, and immeasurable generosity. They will always live in my heart and I pray that one day I can also welcome a traveler and bless them as my Mexican friends have blessed me.